A tale of cattle duffing, horse stealing and bushranging in the New South Wales outback with Captain Starlight. To quote the author "though presented in the guise of fiction, this chronicle of the Marston family must not be set down by the reader as wholly fanciful or exaggerated. Much of the narrative is literally true, as can be verified by official records. A lifelong residence in Australia may be accepted as a guarantee for fidelity as to local color and descriptive detail. To enjoy this book, read a chapter a week. That's about a pleasant pace. Put it down often and really try to imagine the society sights, the sounds, and even the smells. Like many young countries, the first 100 years of Australia's (colonised) history don't yield much in the way of great fiction. You could do a Top 10 list comfortably without missing anything important. 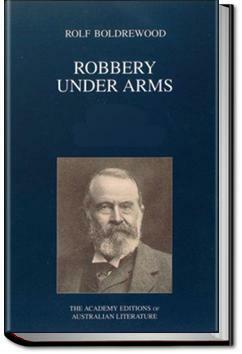 Robbery Under Arms must be on that list.